Here are the wall wash fixtures I have built for my Masters project. I am doing a human factors experiment involving brightness perceptions and comfort in office environments. 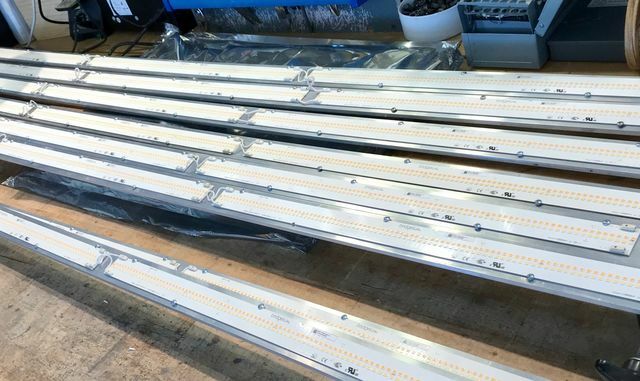 These LED strips are white tunable to either 3000K or 5000K and are designed to illuminate the entire wall from top to bottom. My hypothesis is that participants will perceive the 5000K setting as brighter, even when the luminous flux for each CCT is kept constant. I agree with you, people I talk to tend to describe bluer color temperatures as "bright white". Should be an interesting experiment. Must be a fairly good sized room with the number of 'fixtures' you have there. Even though the led may be rated for less lumens the perception is they are brighter because they are a directional point of source device. Same goes with fluorescent. The higher the kelvin rating the brighter they are perceived. I did an experiment of my own. I put a pair of F72T12/D in a fixture then a pair of F72T12/SPX30. Asked my woman which was brighter and she said the daylight lamps were. I put one of each side by side and she said the spec deluxe lamp was too yellow.